Hey sweet friends! :) How excited is everyone getting for valentines day?! I have to say I've already busting out the valentines chocolates, needless to say, I'm loving it! I made this little coffee cozy to keep my teas and such nice and warm, it was super easy to make and I'm loving how it turned out! I've tried various coffee cozies before but I've never been a huge fan of the knit ones because it always makes the mug feel ginormous, like I'm about to drop it so I thought I'd try felt! I looooveee it! 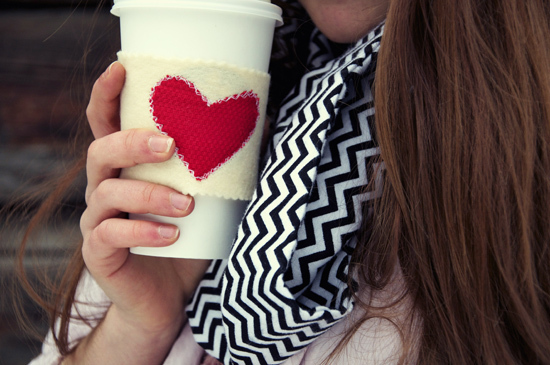 It feels like a sweet baby blanket for your mug, gahh so soft!!! Here's how I made mine! You'll Need: Felt and fabric (colors of your choice), scissors, sewing machine and a template for your cozy, I used this one from Martha Stewart. 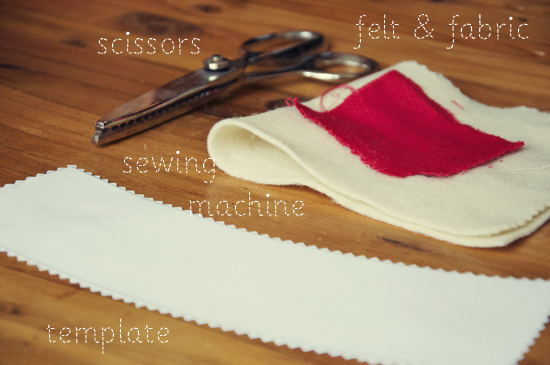 Step One: Cut out your felt strip using the template as a guide. Step Two: Cut out a heart and lay it on the middle of your felt. 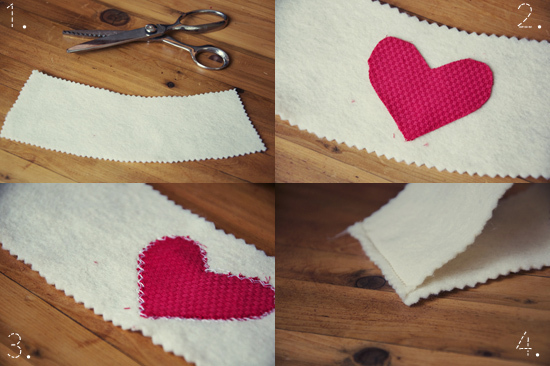 Step Three: Zig-zag stitch over top of your heart to secure it to your felt. Use pins if you feel the need. Step Four: Sew your two ends together with a simple straight stitch. Try to get as close to the edge as possible. 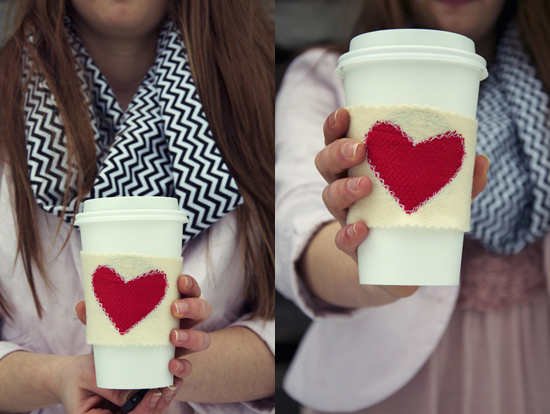 I also love this because its perfect for Valentines but also any season! :) Perfect amount of cuteness! 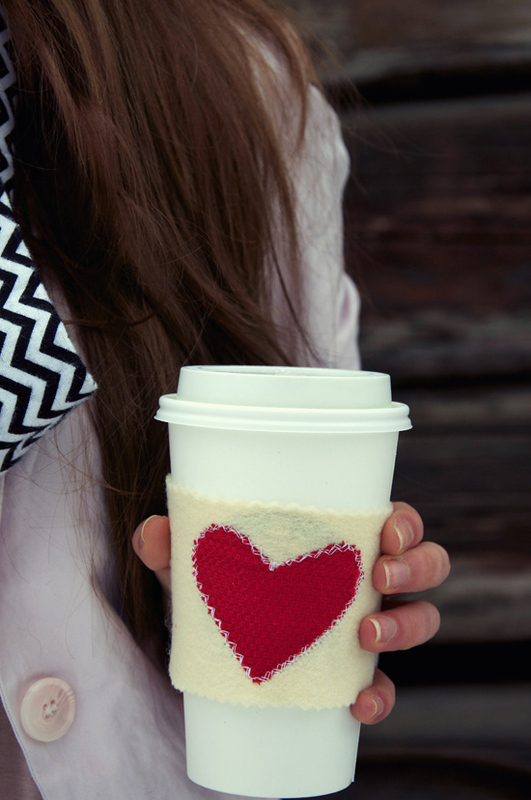 Loving this heart cozie by the way, I've been wanting to make a few knitted ones. That is so adorable! I want one :)! Love the new blog design by the way!! This is so adorable you should totally sell these on Etsy!! Or do you already do that? Aww! Super cute! Definitely have to try this one out! 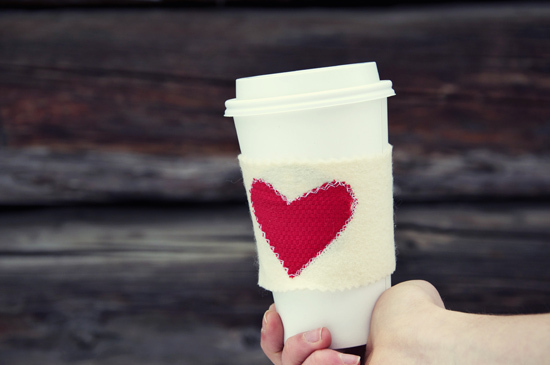 This would be the perfect Valentine's gift for my coffee loving husband :) Very cute! such a cute diy!! i love it! Just came across your blog today and am a new follower! This is so cute and simple! love it!